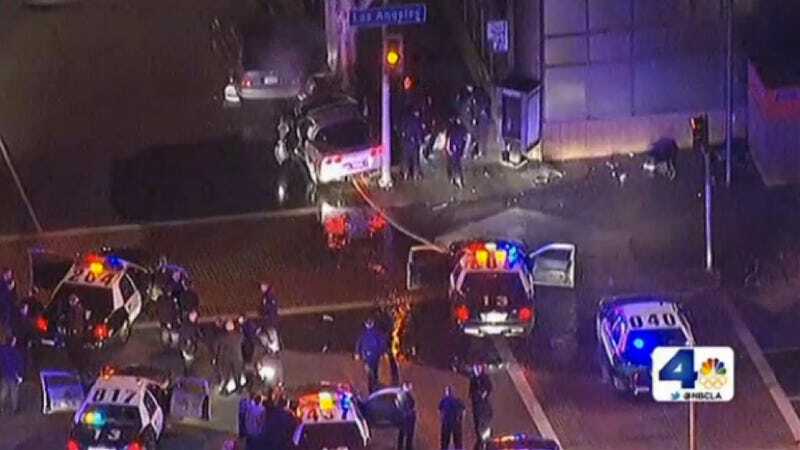 After Friday's high-speed chase through Los Angeles ended in a major crash and the death of a Corvette driver who was speeding through city streets, the LAPD is coming under question as to whether officers should have shot the man – especially since he might have been schizophrenic. "He heard voices so he probably saw the helicopter lights, the lights of the cops pursuing him. It scared the hell out of him." Beaird led police on a chase for about an hour on Friday night before crashing into a car at a South LA intersection and coming to rest. Video showed him getting out of the Corvette before being shot by police. The LAPD hasn't released many details about the incident, including whether or not a bean bag was fired first. Chief Charlie Beck said he's holding off comment until the investigation is complete.